Robbie Deans and the Australian Rugby Union (ARU) are risking the long-term health and welfare of Kurtley Beale by calling him up to the Wallabies squad to face the British & Irish Lions, Brendan Cannon says. The ARU confirmed on Sunday that Beale would join the Wallabies in camp ahead of the three-Test series against the Lions for the Tom Richards Cup, capping a remarkable rehabilitation from alcohol-related problems. The incumbent Wallabies playmaker had been limited by injury and suspension to little more than half-an-hour's game time in the previous three months: he missed six Super Rugby games with a broken hand and his first suspension, after a drunken altercation with Melbourne Rebels team-mates in Durban, before he was stood down for a second time after a cameo appearance against the Chiefs in early May, after breaching behavioural guidelines as he battles alcohol problems. But he showed enough playing for Randwick against Sydney University in Sydney's Shute Shield club rugby competition to be invited to train with the Wallabies last week, and Quade Cooper did not do enough for Queensland Reds against the Lions at Suncorp Stadium in Brisbane on Saturday to sway Deans' mind to leap-frog his friend in the pecking order. Cannon, who played the first of his 42 Tests for the Wallabies as a second-half replacement in the second Test against the British & Irish Lions in Melbourne in 2001, said that rugby had a duty to protect Beale from himself no matter how much benefit he could bring to the Wallabies against the Lions. "He needs support at the moment in this stage of his life," Cannon said on Sunday after commentating for Fox Sports on the Super Rugby match between Western Force and New South Wales at nib Stadium in Perth. 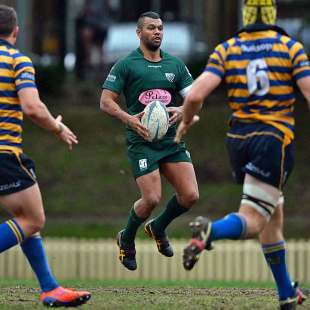 "But I think the long-term benefit for Kurtley is that he misses rugby at the moment to get himself right. The ARU are selfish in their view of looking getting Kurtley back in a matter of weeks of him with his recent indiscretion. I think [it] shows a naive perspective on the fact they think Kurtley's more valuable as a footballer than the long-term perspective on his life. "I think he needs to miss this series to get right long term. And he'll always come back to football because he's a wonderful athlete." Cannon previously has criticised the ARU for gifting Beale what he has described as "an inside run and preferential treatment". "Beale is a player who can win Australia the series against the British & Irish Lions, but his personal welfare must be the primary focus," he wrote for Rugby Gold after the playmaker was suspended for the second time this season, missing Melbourne Rebels' Super Rugby match against the Blues at Eden Park in Auckland on Friday, after he admitted breaching "behavioural protocols" established by the club, the Australian Rugby Union and the Rugby Union Players Association in consultation with the player himself. Those protocols were established in the wake of the incident in South Africa when Beale, who had been drinking, punched then Rebels captain Gareth Delve and team-mate Cooper Vuna. It has also been reported that Beale was seen drinking in public at a Sydney club rugby match in April. "Rugby is a very distant secondary consideration at the moment. It is a shame because Beale has such extraordinary talent." Greg Martin, Cannon's co-commentator on the Fox Sports broadcast, who played nine Tests for the Wallabies, making his debut against the Lions in 1989, said the ARU "don't care" about Beale's long-term welfare. "That's after the British Lions they can sort that out," he said. "They've got to win here and now, and Robbie Deans is out to save his job. He's got 240 minutes of football to do it; he believes Quade Cooper can't help him."